I apologize for the sometimes hard-to-read subtitles, but it’s from the official website! Roadside Romeo marks Walt Disney Pictures’ first venture into Indian cinema, in co-production with Yash Raj Films, one of the biggest local studios. Disney must have confidence in the Indian market as, in addition to two more animated features with Yash Raj Films, they’ve begun planning four live-action films on their own, the first two of which are just about ready to begin production. ‘The 19th Step’ starring top South Indian actor Kamal Hassan, directed by Bharat Bala […] will feature Japanese star Asano Tadanabo and Indian actress Asin. Director Bala is one of India’s best-known music video directors. “Step” is said to revolve around the ancient Indian martial arts form Kalarippayattu and will be a multilingual Indian release. ‘Zokkomon,’ starring top child actor Darsheel Safari and directed by Satyajit Bhatkal, is a children’s tale. 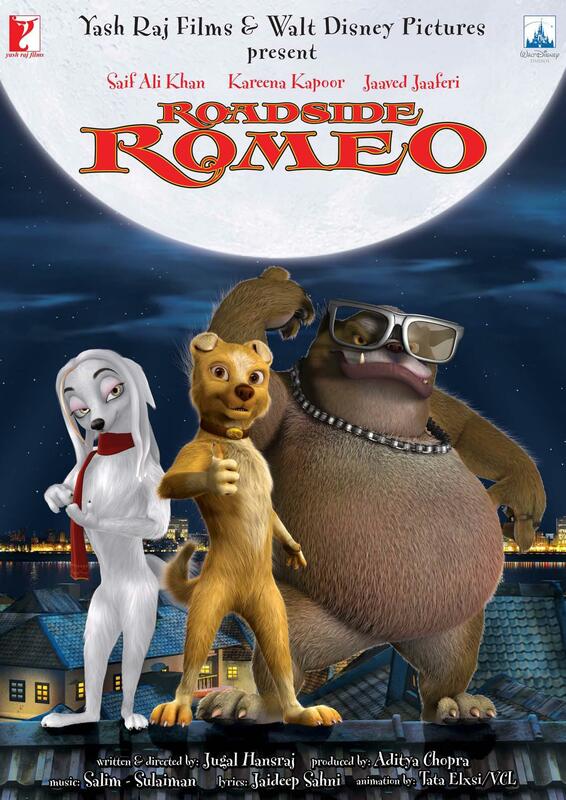 As for Roadside Romeo, which opens October 24th, it is written and directed by newcomer Jugal Hansraj, stars the voice talents of Indian stars Saif Ali Khan (Dil Chahta Hai/Do Your Thing), Kareena Kapoor (Kabhi Khushi Kabhie Gham…/Happiness & Tears) and Javed Jaffrey (Fire). The film follows a pampered dog who is abandoned by his owner and learns to survive in the streets of Mumbai. I’m all for American studios producing movies out of the US. Disney is already doing it in China and France, Columbia in India and China, and Warner Bros in France, India and Italy (and those are only the ones I know about). But why stop there? Why not release the movies you make in those movies internationally? Seems like it could only be a win situation wouldn’t it? This entry was posted in Animated Movies, Business, Family Movies, Indian Films, Movie Trailers, Videos and tagged 'The 19th Step, Asano Tadanabo, Asin, Bala, Bharat Bala, Columbia Pictures, Darsheel Safari, Dil Chahta Hai, Disney, Do Your Thing, Fire, Happiness & Tears, Javed Jaffrey, Jugal Hansraj, Kabhi Khushi Kabhie Gham..., Kalarippayattu, Kamal Hassan, Kareena Kapoor, Mumbai, Roadside Romeo, Saif Ali Khan, Satyajit Bhatkal, Walt Disney, Walt Disney Pictures, Warner Bros, Yash Raj Films, Zokkomon by Mr Hollywood. Bookmark the permalink. the movie does seem to be appealing..
but then what’s interesting is the fact thlat Disney is actually loooking forward to the indian film industry. I guess it all depends on how well the movie is recieved ..which i guess would be loved by everybody as was walle..